There are many fields of application for our ceramic honeycombs. They are used as heat exchangers in systems for exhaust gas and exhaust air purification technology and room ventilation systems for residential and business premises, but also as catalyst supports. 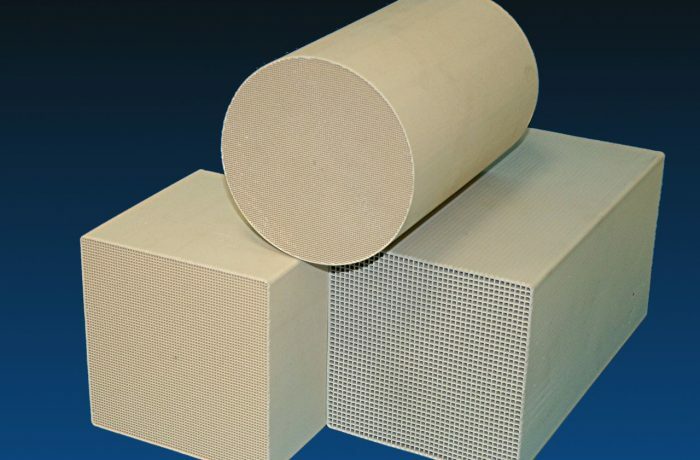 High-quality materials and their special processing make our heat exchangers resistant to chemical, thermal and mechanical influences. High specific surface areas and free cross-sections result in a thermal recovery of up to 95% with low pressure loss. Porous cordierite (MK20) catalyst supports are suitable for coating with active catalytic materials. They are used in off-road emission control systems such as construction and agricultural machinery, locomotives and ships. Heat storage in regenerative thermal processes are used to recover thermal energy. The most important area of ​​application is regenerative afterburning, more commonly known as regenerative thermal oxidation (RTO), primarily for the purification of exhaust air containing organic components. Ceramic honeycombs are an alternative to conventional fillings with ceramic bulk material.